You will need to create a background image for your textfield with a wider width, so that it can cater to a longer width textfield if you need to extend at a later stage. In the HTML below, it’s the normal form markup. Just one thing to take note, which is the span class that wrap around the textfield and the textarea. This span class is use for extending the left corner of the background image for the textfield. Once we have the markup ready, we’ll start off with the normal form styling. Give a display:block; for the label to flush the textfield and textarea to the next line. The rest are some padding and margin alignment. Now, let’s move on to styling of the textfield. As you know we can simply give a fixed width and height properties to the textfield and set the background image, a nice looking textfield appear. However what happened if you need to change the width? Are you going to go through the hassle of slicing your textfield background again? So in order to solve this problem of re-slicing the textfield background, we will have to make it dynamic, the CSS code below shows you how you can do it. In the above CSS code, we have the #contactform li .fieldbox which is the span class to have the background image, and float it to the left. After adding padding-left:5px; you will be able to see the tiny left round corner of the background image. 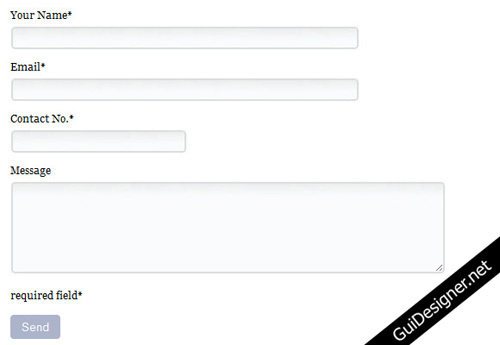 Next, we will have the the same background image apply to the #contactform li .fieldbox input selector with a width. Now you can change the width of your design textfield background image just by changing the value without re-slicing any image. You might want to try using Firebug to change the width of the textfield to see how the background image of the textfield reacts.